The best way of ending those conversations? “Hey, it was really good to run into you, today. Have a good one.” Period. I’ve been working part-time for Hatch Studios in Hutchinson, Kansas for the past four months or so. 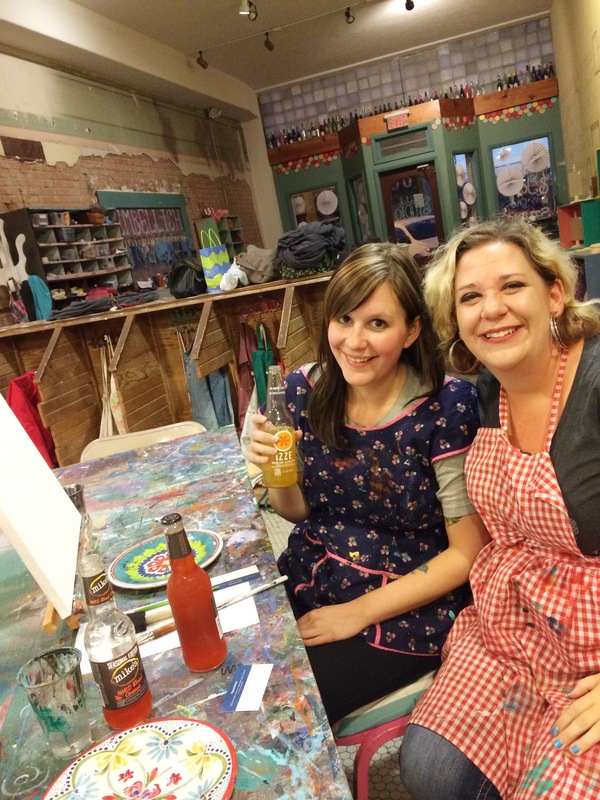 Hatch is a studio devoted to providing space for people in the community to create art. I’ve been a fan/ patron of Hatch since they opened their doors. I love the whole idea and vibe of the place. And one day I reached out to Lacey, the owner, and told her that I believe in her work and listed off all my skills and asked her if she had any need for me. And lucky, lucky me, she said yes. My work is all done online. I believe the job title that we settled on was “Virtual Assistant” and I answer emails and help people to plan their parties. But eventually the feelings of jealousy caught up to me. I was envious of everyone else’s parties and decided to just throw my own. So, I hope this doesn’t come off as a marketing ploy but really I just want to give you an idea of what a night at Hatch is like. I reached out via text message and Facebook and real life to some local people that I like a lot—people to whom I have sincerely said “we should hang out more/ for the first time ever in real life!” As I mentioned before, my birthday is this week. So I used it as an excuse to get a lot of random people together. People that I have only known on the internet, people that I have known in real life but admire, people to whom I am related but we don’t see each other enough, people that I see all the time and can’t get enough of. I set a time and a date and most people said “sure!” And most people were able to make it and it turned out to be so much fun. 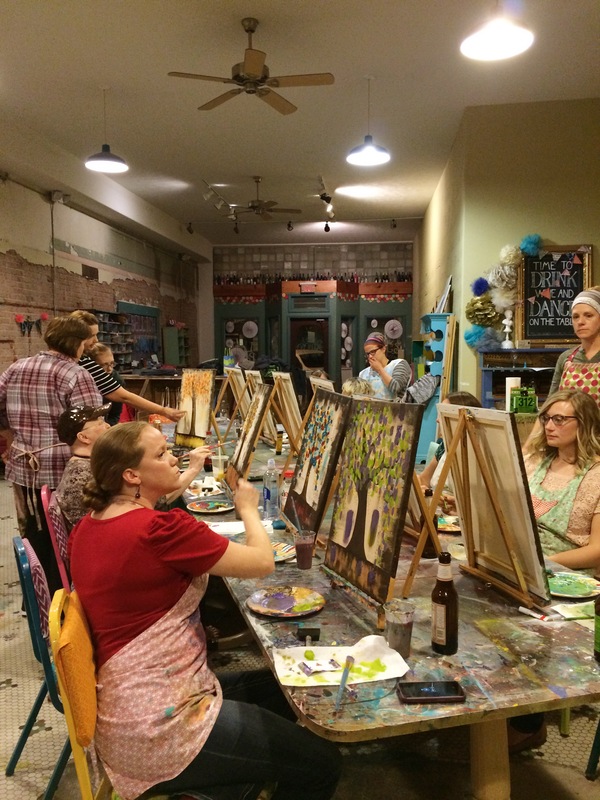 So I booked a Wine and Paint class for last Friday night with all of my friends. I instructed everyone to bring whatever they wanted to drink. I brought cupcakes. Some people brought presents. They sang happy birthday to me—okay, this was officially a birthday party and not just an excuse to get rad people all into the same room. Lacey taught our class and it always strikes me what an incredible teacher she is. She’s so good at identifying potential problems and helping us to avoid them, and providing a lot of information without getting too overwhelming. She’s also really, really, patient. This is probably her most mesmerizing talent. Even when, in the middle of painting, I reminded everyone that there were cupcakes if they wanted one and it ended up turning into a snack break, she didn’t even seem annoyed. If the tables had been turned, I would have been giving so much side-eye at me. 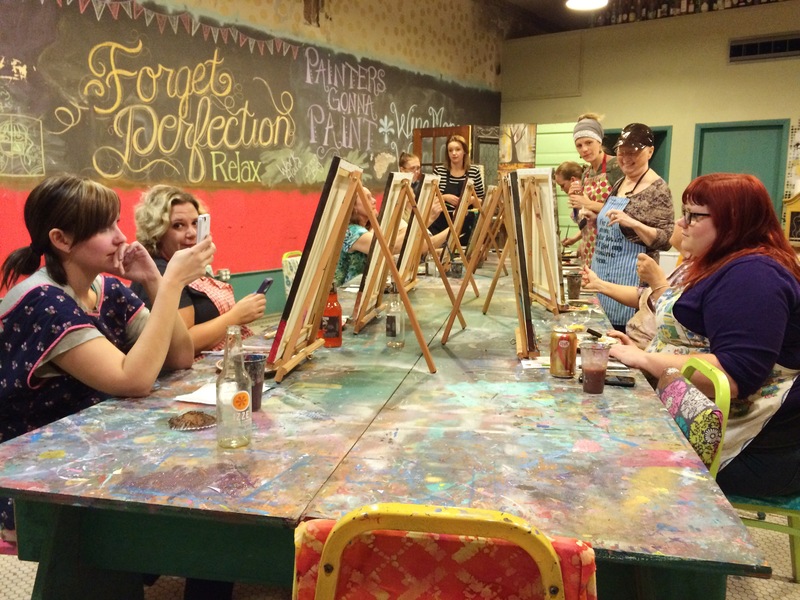 So we walked in, the tables were all set up with easels, water cups, the necessary brushes and a pallet. We got to choose any colors that we wanted, which means that even though we’re all painting the same picture, everyone’s finished product ends up looking so different and full of personality. Everyone grabbed whatever they wanted to drink and we got to work. Lacey said some very nice things about me and then walked us, step-by-step through how to awesomely execute our painting. 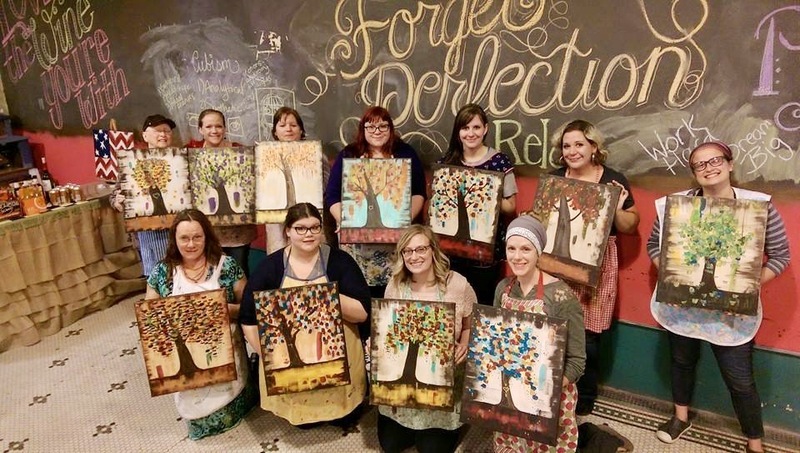 It took about 2 hours and in the end, everyone had a gorgeous painting to hang in their home. 1. It’s natural to really hate what’s happening on your canvas at the time that it’s happening. Through out the whole night, someone (or three or four someones) was saying, “I don’t know about this…” or “oh, no! I’ve definitely ruined this!” But in the end, you have to just keep going with it. Which leads to life lesson number two. 2. Trust the process. Understand that you’re not going to start with a masterpiece. 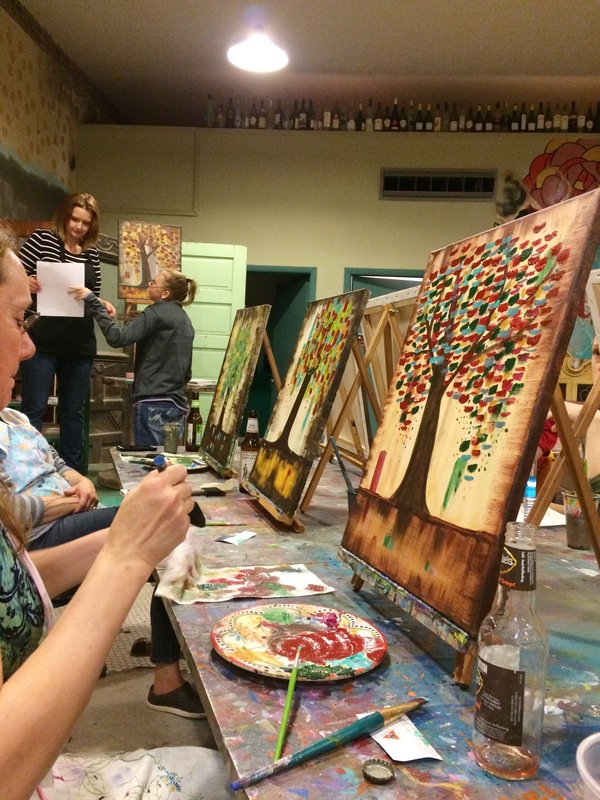 You’re going to utilize a relatively messy method to create a masterpiece and there’s a lot of pride in that. 3. Know when to leave it alone. Otherwise something that could have been lovely is going to result in a big, conjumbled mess just because you couldn’t help yourself from fixing meddling. 4. We’re all going to make it through, in the end, and we’ll have something colorful to show for it. There will also be cupcakes. So thanks to my friends who came to this fun night. And thanks to Hatch for having us. And thanks, other people, for reading this and for leaving nice comments.